This is actually great news. There are more people out there interested in reading than they thought. Now if the price of ebooks could just be brought down to a reasonable level, they might find there are even more customers lurking in the undecided category. Your average heavy reader is older and doesn't want to fuss with batteries, buttons and a dim screen when trying to read. They also don't want to fuss with software upgrades or an initial expenditure of $200 just to start reading. Picture the great alternative. The $5-$10 dollar paperback often has a beautiful glossy cover and very easy-to-read type. If you drop it on the ground, no worries. Just pick it up, dust it off and start reading. After you're done reading, it looks great on a shelf with other books. You can loan it to friends, re-sell or trade it at used book stores. Some books even become valuable with age, as collector's items. In short, the e-book is a complete crock in comparison. While you're waiting for your Kindle, you can download the Kindle software on to your PC. The Kindle appliance itself is easy to carry around, however, you can use your PC to get you started with reading your Kindle books. I was an early adopter of the Kindle and I highly recommend it. Just my 2 cents. I would fire every product manager who was involved with the nook at Barnes and Nobles and the e-Reader at Sony. These are one of the very few items that people are willing to spend the money on and these two idiot companies do not have them in stock!? Are you kidding me? What moron made the decision NOT to produce enough of these readers? B&N should have had hundreds of these in their stores on Wednesday. Not only would they be selling them like hotcakes but it would have also driven traffic into the store, most likely where shoppers would purchase more books, CDs, etc. With so many marketing pros of out of work, it is a shame that the marketing idiots who work for these companies are still employed. I have the Kindle and couldn't live without it. I know people that bought the e-Reader and returned it to buy the Kindle. Not as many books available for the e-Reader as the Kindle. I have to laugh when I see the big hoopla about the E-Reader and the Kindle. I've been using my PSP to read e-books for more than 4 years. I make all the necessary changes to font and color before adding the text to the PSP and my PSP is far superior and easier to read. I can also put it in my pocket. Good luck with those bulky and hazy electronic books. Barnes & Noble and Sony have joined the expanding list of 21st century retailers. Service and delivery are no longer important. "Get their money" is the only motto of modern day retailers. Sony used to be the leader in innovation and customer service. Now they are just a second rate supplier who wants your money but can't deliver the product. I find it ironic that the more these companies rely on computers to streamline their companies, the worse they become at delivering their products and servicing their customers. Welcome to the new age of "Screw the customer anyway you can". e-reader shortage? there's just a reader shortage PERIOD. much ado about vaporware. there aren't any books for the nook, anyway. meantime, there are over 360,000 (including mine) books for the kindle. which you can buy today. It's purely marketing. Amazon did it when they released the original kindle. Apple does it when they release a snazzy new piece of hardware. Barnes and Noble's done it. Sony's trying to do it...considering they really haven't tapped into any measurable market share, who can blame them for trying. It's simply to create "demand" to drive the innate consumer need to have the hottest item. In Thailand, in the business area or IT store I cannot see that or find to buy that, but sometime I see a foreigners people used it to read on the sky train, but the cost of this devices, In my opinion I think it expensive for Thai people, because in the normally Thai people have low salary, Most of new technology or new device that popular, the Millionaire people or the high salary people that very less in Thai can buy it only. But, in fact Most of student that study in the High School very interested with the Technology but they cannot to used or touch it. I think, not only Thailand have this problem only; I think another country in Asian too, for example Laptop or notebook and computer PC, student in the city will can use it first, May be in the biggest school only and after big school buy the new Model the old computer will send to small school or another province more than that after send this device to another province no any staff to fixed it. Because for Thai people, the Technology that use high cost to buy and take care it. I think, it will very happy for student in the during developing country if have some Agss charitable organizations in the world to help them, or support some budget or have a policy for the Company to buy it in the Student prize, that different from EU and America something like that. I don’t know in the business way that is can possible or not, but I hope it. I have to admit that I find this surprising, considering that it's not even December yet. I would be kind of curious as to why they would not be able to have them delivered by Christmas when there is almost a whole month left. I am the kind of person who wouldn't be excessively upset with a slightly late delivery as long as I knew it was going to be late (although it would be somewhat disappointing to not have it to play with during the holiday season and to show all my visiting relatives). Does anyone know what the exact reason for the delay is? This is not really news or for that matter likely to have anything to do with the Holiday's. Amazon's Kindle experienced similar shortages shortly after release and it took them some time to ramp up production to meet the demand. The Kindle has been through several releases and the only reason that it's available on the website for immediate order is that it's reached market saturation and sales are leveling off. B&N and Sony are experiencing similar supply problems, unfortunately it happened right at Christmas time. That's sleazy making pre-order customers wait then putting what you have in stores to sell. I was planning to get one as a Christmas present. I was unhappy to hear they wouldn't get them in until January but I was considering a certificate for one. Hearing about them selling off the limited stock rather than handing them out to those that pre-ordered turned me off it completely. I have zero interest in ever buying one. I had actually considered buying one for myself as well but not anymore. Some one in Corporate thought it'd be a smart business move to make the pre-order people wait. Sorry you lost a customer for life with that stunt. I strongly encourage anyone that pre-ordered to cancel the order and consider other eReaders. They obviously don't care about their customers. I guess it's Amazon for all my book buying. There is no doubt that Amazon will benefit from the delivery issues hurting the Nook and the new Sony daily edition. One thing to keep in mind though is that there are still alot of other great devices out there so you don't have to go without for the holidays. The new Astak EZ reader for example is a great one that supports over 10 formats and comes in multiple colors. There are other readers that are still in stock. The Aztak EZ Reader, EZ Reader Pocket Pro and Mentor,. the Bookeen Cybook and Opus, the Irex ebook readers, the Jetbook, BeBook and the eBookwise 1150 are all in stock. The Sony PRS-900 is the only Sony ereader that won't be available for Christmas. Their other two models, the PRS-600 and 300, and still readily available, and even the 505 in some locations. Considering there's about 20 ebook readers on the market, I don't think 2 being sold out constitutes as an ereader shortage for the holidays. A real book or magazine, made with real paper, and having a real cover, and real photos, beats Kindle, e-reader or any other electronic book. Plus a real book doesn't need a power supply, doesn't break if dropped, is not expensive, and can be "borrowed for free" from the library. Whats up!!! Not a single article on climategate!!!! This is serious, we are all about keeping the earth clean and green tech, but if their lying to us, lets redirect the research, money and effort to something usefull!!!! I have to say, I was one of the original users of Kindle 1.0 and loved it from the start. I upgraded recently after looking at all the alternatives (e.g. Sony, Nook and a few others) and stuck with the Kindle. It has worked great, customer service is awesome and it really is a tough traveling companion (I travel all the time). I have to say it was one of the best traveling gadgets I have and I will continue to stick with the Kindle. Um, Ben, if a product has been on the market for 18 months, then maybe people should have bought the darn thing months ago rather than wait until a month before Christmas. Just a thought. The notion of carrying around a hardback book is as obsolete and outdated as sadling up your horse Trigger and heading into town to pick up the Monday paper, it just isn't valued anymore. What is valued is the ability to have unlimited media resource's at your finger tips that will allow you access to news event's, email, your favorite book in e-book form and other media that the e-book brings to the subscriber. The price may be hefty, buit think about next time that you are on your plane ride across the country or traveling across the country in a car, would you rather have all of today;s media events at your finger tip's in e-book form or do you want to have to spend the time to pack all of those paperback's into the car or carry-on, where you constantly have to pull over and get a new book that takes time out from getting to point A which then causes everyone to become aggrevated and pretty much ruin's the vacation.Then you have the plane flight, you constantly reach overhead of your flight passenger to get a new book from the overhead compartment which will cause them to become aggrevated as well making the flight less enjoyable for everyone. The e-book is simplicity in keeping knowledge at the readers finger tip's on a constant basis, something that a hardback book could only dream of providing it's reader with. Kindle snobs must own I-phones too. Both are "designer label" devices, shorter on features than their competitors, but ohhhhh, so trendy! Me, I buy for value and let the snobs have their status highs. 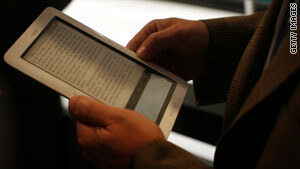 Sony e-readers dwarf Kindle in features, like FREE books, not ONLY Amazon choices. But heck, you get stared at in Starbucks if you pull out anything but a Kindle or an I-phone. As the Production Manager of a book publishing firm in New York, I do take an interest in the success of this new technology. On one hand, it opens a new venue for making books available to millions of readers around the world; especially books that have been deemed out of print for a long time. Personally however, I would still prefer to read a hard copy of a new book over an electronic copy. I can see the pros and cons on both sides of the spectrum. I was given a Sony reader for my 65th birthday. I asked other Kindle users and Sony readers for their opinions. SONY was the best buy. I can also download free books from the local library. Also, why wait until the end of the year to buy?? Whoever said those product managers should be fired for not having the inventory available is SO right. I thought about an e-reader, then checked prices and capabilities of several different ones. I was rapidly convinced by the ads NOT to buy one now, the prices were too high and capabilities too low– prices not expected to come down for a couple of years. So I purchased a used Fujitsu Stylistic Pen-based computer at a price very competitive to a new e-reader. And I got an entire computer, with XP. A couple of dozen updates later, and some FREE software and I had what I needed (maybe not what I had originally wanted) that performed more than I needed at a cost less than I expected. To all e-reader naysayers, you are fighting a lost battle. This is the way of the future for both leisure reading and more importantly text books. You may love the feel of that hardback, the excitement of finding that rare first edition or grabbing a well read paperback for 25 cents, but you cannot deny that e-readers offer features that printed books cannot compete with. Changing font size, text to speech, built in dictionary, free samples, immediate downloads, so many free titles… the list goes on and on. This is not to mention all the paper that is saved, that updates can be automatically made and most importantly – there will never be another sold out or out of print title once a book is available in electronic format. I will admit that there is some missing technology, namely color pictures for those of us who like to read about art, architecture and travel, but I have full confidence that this is coming. There is a difference between loving books and loving to read. E-readers are for those of us who love to read. If you think it's easy to keep an outdated book in print economically at a cost that we'd be able to successfully translate to the average consumer, then you're a better man than I am. Of course we'd ideally prefer to keep every book in inventory, but there's costs involved when you only want to print a limited amount of books based on past sales. If you'd order 1,000 books that only sell about 100 or less per year, you're faced with the warehouse costs to keep those in storage until the end of time. Book-reading is to e-books as dining is to being fed through a tube in the stomach.. Dining is more that getting nutrition. Similarly, reading a real book includes the experience of physically opening a book, thumbing through it, reading a passage here and a passage there, smelling the paper and the binding, marking a passage of interest, and so on. Then there is the matter of convenience: a book can be loaned, tossed in a handbag, read at the beach, and never ever requires batteries. I want an e-book. I want to be able to store all my favorites in a device that I can take anywhere so I can read and re-read them at will. I do not want to spend @200-300 for it.. I want to spend no more than $50. I want a common universal format with no DRM so I can back them up or read them on other devices (like my laptop). I do not want wireless access. I have no problem downloading books on my computer and then transferring them to an e-book. This would save a big chunk of change. E- books should be a small fraction of the cost of a bound book for obvious reasons. They are much to costly now- I can often get bound books cheaper! Smarten up publishers and supply what the market wants, not what you want to sell. Learn some lessons from the music industries stupidity. I wonder how much of this shortage is them anticipating market share being gobbled up by Apples upcoming (and highly rumored) release of the "iTablet" or "iPad" or whatever you want to call it. With a possible screen size comparable to existing e-readers, it will surely be more than just an e-reader with all the other bells and whistles the iPod touch and iPhone have. I don't consider myself an Apple "fan boy", but I have enjoyed my iPod touch far more than any other electronic device I've owned and the idea of a super sized iPod touch just thrills me. I would definitely use it as an e-reader as well. The Nook and Kindle do not interest me. But...the price points will be different, and there will always be those who want a less expensive, less complicated reader, but for how many? And how many will pass up the Kindle or Nook for a Super iPod touch that can be an e-reader+ many other things. Would Apple come to market with an aggressive price point that forces the other companies to drop the price of the Nook and Kindle? Not likely, but I can dream. Overall, I hope the age of the digital tablet is here, even if it's tried before and floundered. RFK, I couldn't have said it better myself! I am an avid reader and have owned a Sony PRS-505 for almost two years now. It is the best investment I have ever made. I generally read 4-5 books during a one week vacation and always had to sacrifice room in my luggage for my books. With the e-reader, I can bring many books (15, 20, more) in less space than it takes to hold one paperback! Yes, I will still pick up traditional books when they are greatly discounted but I will always love the portability and features of the e-reader! For anyone that wants to do the actual research, the features of and content available for the Sony readers beat the Kindle hands down. I guess having the "it" product is more benifical to some folks than having one that's truly functional and versitile. Kindle is great ... and apparently the only E-reader on the market without a really stupid name 😛 I got a kindle DX a few months ago after checking out my mom's, and I love it. It doesn't use an LCD screen, so no eyestrain and can read it in full sunlight, etc. Battery takes weeks to run out, even with fairly heavy usage. Holds tons of books, so it's great if you have space limitations, like moving out of country. Not all books I want are in kindle format, but most are. Hopefully the rest will evolve soon! Someone please explain the difference between carrying a $200 electronic device to read an electronic book and just spending $25 on the book? This really reminds of Twitter (which is for those with no job...or no job that involves real work). Why in the hell would anyone want one of these things? I own a Kindle 2 and love it! It is easier to read than a paper book. I can set the text size as needed. And the best feature is the built-in dictionary. Run across a word – often an arcaic word in an old (free) book and instantly I have a detailed definition. I run across a reference to a book. No more ordering a new or used book and waiting a week. In 60 seconds it's on my Kindle and I'm reading. With so many books available for free or $1 or $9.99 for NY Times Best seller books and this thing can actually pay for itself. I ordered my Kindle from Amazon.com yesterday and just got an emailing saying it has been shipped to my parents for arrival on the 3rd. Actually everything I ordered from Amazon yesterday has already shipped. What a relief! The cynic in me tells me that they intentionally underestimated their needs to drive PR like this. Supply. Demand. Simple. The only shortage is eReaders with wireless capability. There will be plenty of Nooks under Christmas trees but B&N underestimated demand so there won't be enough to go around. Some folks who ordered them early are now selling them on eBay for close to twice the list price, before they even take delivery. The Sony Daily Edition has an uncertain ship date, so it's a gamble. The Kindle is the only one that is currently sold in the US that can guarantee delivery by Christmas. If want an eReader but you don't need wireless access, you're set, because Sony and other retailers are offering really good deals to move older models out before the Daily Edition comes in. If you want to borrow ebooks from the library, you're better off with a Sony anyway, at least right now. Personally, I love my Kindle and I'm glad I have it because I find I read more with it. Once I start reading, I forget I'm holding an eReader and I get lost in the story. Being able to crank up the font size is dim light is worth a hell of a lot of old book smell to me. That said, the eReader market is exploding. If you're not sure what you want, just wait six months. It will be a whole new ball game. Response to Dwight Huth. Oh my God, it is so hard to pack three paperbacks into my suitcase. And, oh my, the minute it takes for me to pull one out of the overhead is SUCH a major inconvenience. I don't know how I do it; I can't go on. How many books would I read on a flight where I "constantly reach overhead of your flight passenger to get a new book from the overhead compartment"? Oh the horror; it is such a hassle!!! You may read two, tops, on a cross country flight. And why are you reading and driving as you must be if you have to pull over to get out a book? I've had so many vacations ruined when, reading while driving, I had to pull over, unpack the whole car, get my book, and repack. It's a bit quicker to open my book to the bookmark then to turn on the e-reader and go to where I left off, by the way. And what is with all those apostrophes??? "Finger tip's" ??? "paperback's"??? Plural = no apostrophe. Possessive = apostrophe. my boyfriend wanted to buy me an e-book. no thanks. i love going to used bookstores and finding good books. love to sit under my big oak tree, or on the porch, turning the well-worn pages of a popular sci-fi novel. love putting the bookmark my mom gave me down so i can pick up right where i left off. i always have 1 or 2 books in my bag. have never been big on techno things. love libraries. some of my fondest memories are of my mom taking me to the kid section and getting a gold star on my bookmark for every book i read. I'm very happy with my Kindle. The books I've got on it would require me to push a shopping cart around if they were all in paper. It's a solid device at a good price point. I've owned a Sony eReader for a few years now (the PRS-505), and I have to say, even after all these years, as far as side-by-side comparisons of feature sets it has, by far, more features that serious readers would want, even when comparing the newer models that have come out. I realize the Sony doesn't have any wireless download capabilities, but really browsing for a book via an eReader interface would seem rather tedious to me. I'd rather browse online in my favorite browser on my PC, have the book downloaded to my PC then transfer it to my eReader either via sdRAM chip (which the PRS-505 has two slots for), or via USB cable. It allows me to maintain a local backup of the downloaded book via the process naturally. Also, the amount of FREE content to be downloaded and read is enormous, and given the large number of supported formats with the Sony PRS-505, I've no shortage of content. Other eReaders have that support less file formats may have an issue with content, but so far there hasn't been a book yet I couldn't find and read on my Sony PRS-505. If you're technically savvy enough you can even easily find non-DRM'd copies of books so that price of a book doesn't have to be a road block when it comes to getting content for your eReader. In my opinion the electronic paper used by most eReaders is actually as good, if not better, reading than standard paper back pulp pages, and getting a book light to fit your particular eReader is easy and not overly expensive, and it sure makes night time reading extremely comfortable. The key thing for those who are older and love to read is the ability to increase the font size, something you can't do with physical book. With an actual physical book you have to purchase large print or use a cumbersome magifying glass, or reading glasses. With almost all the eReaders available today, a simple press of a single button and the font size is increased to a comfortable reading size. With higher end eReaders (like the PRS-505), you can download AUDIO books to it and listen via head phones as well. My eReader was a great investment. When I travel I love being able to carry that single device as opposed to two or three books. If I'm reading a multiple book series, I can download the whole seires, reading one book right after the other without having to worry about where I left the next book, it'll always be in my eReader. I've even downloaded work documents and such for review, just so I wouldn't have to pull out my laptop to read a project proposal or spec sheet. Plus, given the ability to easily update/correct documents and download them makes the benefits over physical paper books to the environment priceless. There's a reason why China is extremely dedicated to the ebook/ereader market. There's not enough trees on the planet to keep their schools and universities in up-to-date text books, and if I miss my guess, I'll bet the ereader shortages in the west can be tied back to the huge demand for ereaders in China. Give me a good old fashioned hard cover or paperback any day. Low Tech will come back because more and more people are Tech Tired. My wife has a Kindle and I have the Sony PRS 700. I prefer the Sony to Kindle. Sony's touch screen makes turning pages easy plus 100 of free classics. Try the e-reader. I have a Kindle, second version and I do love it. I love that I can have several books at one time in one place. It is awesome. However, I still read paperbacks too. in fact, I read now more than ever for with the free sample downloads, I am ALWAYS reading something and I decide what is good enough to buy, or even save for later. It is great. People sure get mad over new technology. It's pretty funny to read some of these comments. I can afford a Kindle, but why? I like walking to the library. I like the feel of a book. Like that I can be careless with it. I guess if I traveled a lot, then maybe I could justify buying one. Has anyone explained why these readers will be avaliable a week after Xmas, but not before? I can't imagine a manufacturing process that makes a million readers all available on the same date, but none before. What about the Astak EZReader and the Astak EZReader Pro? Sony, Amazon and B&N are not the only game in town for eBook readers, and the Astak seems to be superior than the others are in many respects. Man! Love the ereader/hate the ereader. Who cares about people who can't see the light of day through their haze of negativity. I love a good book, but I also love my PRS 505. There are merits to both, but I think the screen on the reader simply makes reading enjoyable again. As has been mentioned before, you can adjust the text size to your sight. You don't need glasses if you don't have them with you. You can carry many books at a time. Memory in my case limited to the size of the memory cards. The 505 supports both Sony memory sticks and SD. If you don't like the idea, why scoff at it? I do think that the Kindle has sparked an interest in something that has been bubbling under for years. I've used an old Compac PDA with an SD card to carry books for a few years now. This is the next step for me, and I'm glad I took it, despite the price. For me the bottom line is convenience and enjoyment. I always had a book with me, now I have my 505 with all the books I need or want. I use a third party software to convert lit, html, txt, pdf and nearly any other format to the best format on the 505. The Sony will read most of them, but I don't sweat the formats it can't read because I can always convert. The battery life is incredible with these things. I go a few weeks with out charging. Plug it into your computer and it's charging. I wouldn't hold my breath for color screens or backlights. There was an ereader with a backlight, but it's battery life was poor. The epaper that the Sonys and Kindles use maximize batteries like no device I've ever seen. If you don't like the idea, don't bother. Don't buy. Just keep reading your trusty paperbacks. I still do from time to time. There is no need to put down people who see a benefit from something that you don't. I think it is possible to find a balance between reading a physical book and one on an e-reader. If there should be any display of anger or being upset is that there are many people that are NOT reading; that should be the issue not arguing between physical books and e-books. On my Sony Touch reader, I have the constitution and the Declaration of Independance. I have the Bible and the Koran. I have Atlas Shrugged. I have the latest Vince Flynn novel. I have many of my service documents. It is ALL on an 8mb SD card. If I get that full, I can put in another card. The Sony can run a 16gb memory stick and a 16gb sd card. I can completely back up the cards. I can access the Guttenburg project. What I AM going to do is find a way around DRM so that if I buy a different reader, my library is not useless. I bought the content, and I will be damned if the DMCA is going to circumvent my rights to my property. As long as I do not sell or give the stripped books to anyone, there is no reason that I should be guilty of any crime. Archival copying of records, cassettes, and CDs never hurt their sales. MP3 vendors have finally gotten wise, and I buy 99c tracks if there is a single song I want. If I want the album, I go buy the CD. (Why not just digital – like the books on the ereader??? MP3's are compressed and are not of the same quality of the uncompressed tracks on the CD. A book...well if the words are there..........) Amazon is being shortsighted in not selling ebooks to the owners of other ebook readers. They are primarily a content provider...not a hardware vendor. I realize they want to sell Kindles, but they could sell EPUB versions for the same price and I would buy from them all the time. Their ebook prices are better than most. Barnes and Noble is in the process of setting up to sell EPUB books. EPUB is Adobe's ebook format. So Sony, B&N, Shortcovers, Borders, Sony Bookstore/Borders will all support the Sony. What Amazon is telling me is that unless you buy the reader from us, we do not want your business. This is stupid. Still looking for a new eBook Reader ? I think e-readers are one of the greatest inventions of the 21st centuary, with advents such as the IPAD and the Microsoft courier, things are about to explode. A simple lesson for those Kindle keepers, were you aware that switching off and on your Kindle takes much more electrical power compared with letting it sleep?